The JustType online website builder is not just for small businesses building DIY sites. It can also be a useful business tool for creative professionals, as one Devon-based agency found out. The Little Fish is a small team of creative professionals providing a complete marketing service to clients around its base in Plymouth, Devon. Services include branding, literature design, copy writing and web design and SEO. They have produced websites for a wide range of businesses, including high-end database and e-commerce solutions. However, it was addressing the web design needs of small businesses that The Little Fish was finding difficult. Jeff was introduced to JustType through a business acquaintance and decided to try the product for a small business customer. 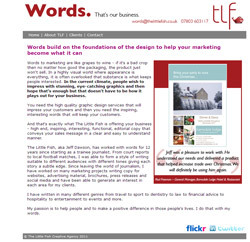 The Little Fish has now adopted JustType as its preferred design tool for SME websites. As it is based on pre-configured layouts, the design team doesn’t have to cost in creative design time for building smaller sites from scratch. In most cases the websites built using JustType have been handed over to the clients so they can be maintained themselves. There is however, plenty of scope for value added services. Many of the JustType sites that The Little Fish have designed have involved charging for upfront services such as graphic masthead design, copy writing and even photography. This means website design using JustType is very profitable for the company as the cost for the basic site is just £49, including hosting and domain name registration, and about a couple of hours of their time. The Little Fish also receive annual commission from every JustType website they sell, building on-going revenue that requires no input or support. “It may be a tool for creating simple websites, but once you get to know the product there are some really powerful features that allow us to make the sites look bespoke,” continues Jeff. “We are also impressed with the fact that the JustType website itself is built using the JustType product, a fact that we point out to our clients. And when we do hand over the sites to them they soon get to grips with the online Administration Centre, which they use to maintain their own site. 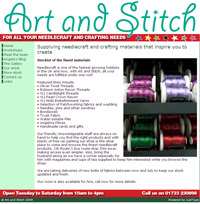 The Little Fish provided a complete website design solution for Art ‘n’ Stitch, a shop supplying needlecraft and crafting materials. This included masthead graphic design, copy writing and the photographing of their premises and products. Once complete the site was handed over to the client for on-going maintenance. This was an important factor for the shop as they run a number of craft workshops throughout the year, which are detailed on an events page on the website that needs constant updating. Sheryl Ryan is a promising singer that’s causing quite a stir, both locally and nationally. Sheryl came to The Little Fish after her existing website couldn’t be expanded to accommodate the downloading of audio samples of her music. In addition the site was costing £150 a year to host. JustType was an ideal solution that provided Sheryl with a low-cost, good looking website that provided all of her music downloading needs. The entire website was designed and configured by The Little Fish and is now maintained by the client.